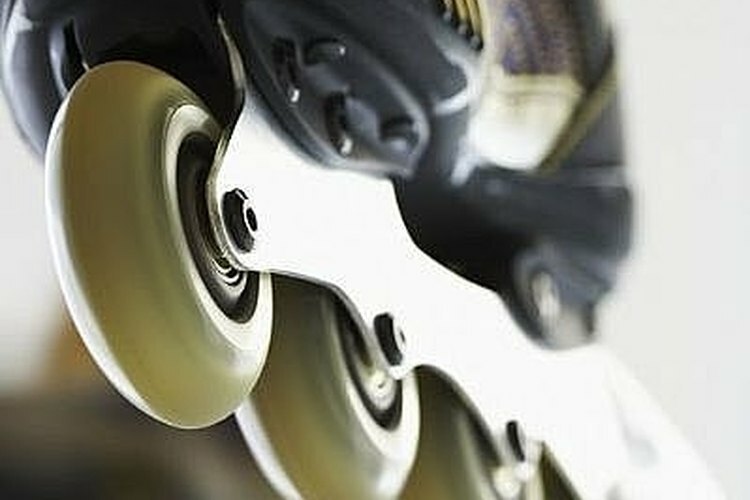 Learning to skate is like learning to ride a bike: Once you get it, you get it. Then the rest is all about honing your skills. For kids these skills will come in handy for neighborhood inline skating, ice skating parties, future hockey teams--or just working on their balance and skills. Here are some steps for teaching kids to skate. Start off on the carpet. Let your child get comfortable with the feel and fit of the skates. Practice falling. Teach her that when she starts to feel wobbly, she should squat down. This lowers the center of gravity. If she can't recover and stand back up, she should drop and roll to the side. As much as possible, encourage her to roll into a ball instead of catching herself with her hands. Teach him how to stop. (Bend knees slightly and push down on the heel brake. Shift weight to the opposite leg.) To practice stopping, try a revised game of "Red Light, Green Light." Have your child skate toward you (either in socks at home or on the actual skates outside) and stop every time you say, "Red light!" Teach her how to start. Do a penguin walk with your heels together, toes out. Take small shuffles and then small marching steps. Emphasize baby steps. Don't worry about pushing off or actually skating yet. To learn to move forward, first practice the pushing motion in socks on a smooth floor. Emphasize that the feet move outward at a side angle, not in a forward walking motion. It may help to set up cones or other markers to show kids which direction they should move their feet. Help her find some balance. Extend those airplane arms to keep steady. When you head outside, find a flat, even surface. An empty parking lot or outdoor school pavilion is a great place to learn. When kids are first getting started they may feel more comfortable stopping by skating into a grassy area. Keep that in mind when you pick a location. Keep practicing and keep encouraging your child. Be heavy on the praise and light on the advice. A tired, cranky kid will likely be an uncoordinated student. Practice new skills when everyone (teacher included) is feeling fresh and enthusiastic. Inline skating is an inherently dangerous activity. If you have concerns about the risks for your child, consult your child's pediatrician. Elizabeth McGuire is a writer and outdoor enthusiast. She has been covering recreation and fitness topics for more than 10 years and now aims her writer’s eye on the little ones in her household. Her work encourages parents to raise active, adventurous families. She lives and runs in Austin, Texas, where she serves on the board of the Town Lake Trail Foundation.